So this week’s Friday Favorite is kind of a cop-out. I didn’t really make any of my standby recipes this week, so I figured that instead I’d go generic with this one. And by generic, I mean I’m focusing on a single fruit that is definitely an autumn favorite: pumpkin! Just yesterday I told you about the pumpkin French toast I made to accompany a tofu scramble. What I didn’t tell you was why I decided to make it in the first place. You see, a week or so ago, I made a mistake I hadn’t made for two years: during a rushed trip to the grocery store, I accidentally purchased a can of pumpkin pie mix instead of plain old pumpkin puree. My wrath when I realized my careless error was towering, but eventually it subsided and laziness edged out my anger. Instead of returning the mix, I decided to use it. It was the perfect choice for the French toast mixture; I just used less almond milk because the pie mix is more liquidy than regular pumpkin puree. After the bread had finished soaking in its their pumpkin-y bath, I had a soupy mixture of mostly pumpkin, almond milk, and spices left. It seemed a waste to throw it out, so… I made it into muffins. Yep, that’s pretty much exactly what I did last time I accidentally purchased pie mix. These muffins, though, were about 50% more delicious than the ones I made last time. They’re also a little less healthy, but them’s the breaks. I’m pretty proud of these muffins, actually. Usually when I create a recipe from scratch, I measure out my ingredients, just to get a sense of how much of each is going into the batter or the dough. For these muffins, though, I went on intuition alone, adding a pinch here and a scoop there and trusting my baking skillz to tell me when the batter was ready. And you know what? My baking skillz must be pretty darn good these days, because my muffins turned out pretty darn well – fluffy, moist, and sweet-but-not-too-sweet. 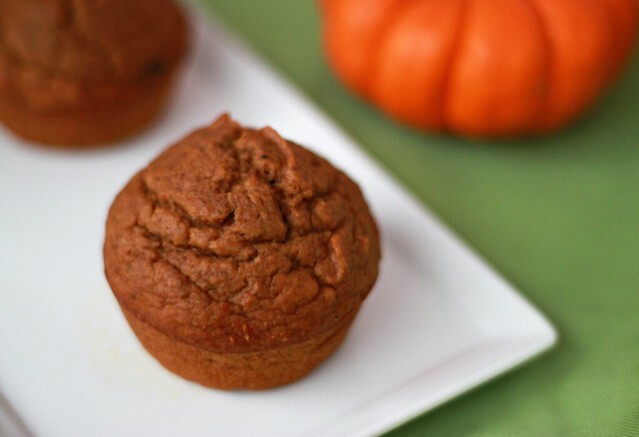 You can’t go wrong with molasses, dark brown sugar, and pumpkin pie spices! How strong are your intuitive baking skillz? What do you do with accidental/unwanted purchases?